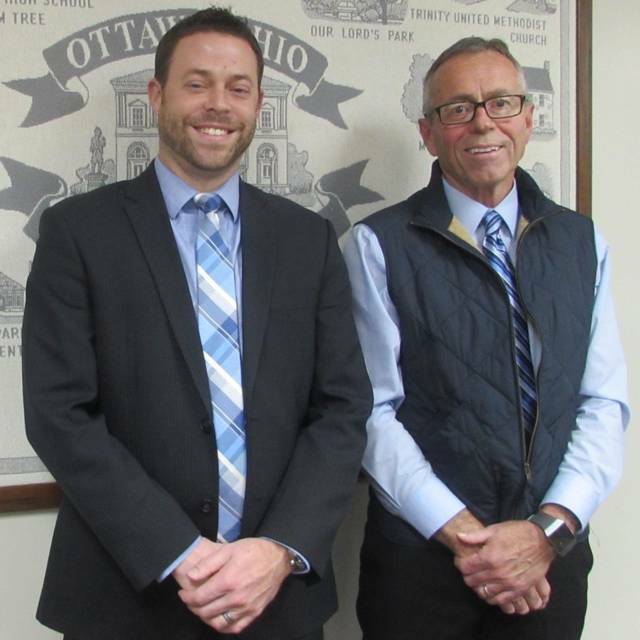 Outgoing Ottawa-Glandorf High School principal Jayson Selgo, left, poses for a photo with his interim replacement, Mark Fuerst after the school board approved Fuerst’s appointment Wednesday. OTTAWA — Mark Fuerst was named Wednesday to serve as Ottawa-Glandorf High School’s interim principal. The Ottawa-Glandorf Board of Education voted unanimously for Fuerst to serve in the position on an interim basis. Fuerst, 65, will replace current principal Jayson Selgo, who has served in the position for the past 6 1/2 years. Selgo will become superintendent in his hometown of Archbold. Fuerst will work no more than three days per week from Monday to Dec. 31 and full time Jan. 1 to June 26, 2019. Fuerst said he is looking forward to his new role as principal. He is a retired principal from Delphos schools and at Gomer Elementary. “It’s an honor to be working here at Ottawa-Glandorf, and with Mr. Selgo leaving, there will be big shoes to fill,” Fuerst said. His goal is to shadow under Selgo for a while, and he said he does not plan to make major changes. “I like to serve kids and teachers, to be the snow plow to make sure everything runs smoothly,” Fuerst said. He previously had served as a substitute teacher at Ottawa-Glandorf. “What is great about this district is how they come together and support each other. This is a great place to live and raise kids,” Fuerst said. Superintendent Don Horstman said Fuerst’s experience of serving as a school administrator will assist him in his new role as principal. “His working as a sub and as a mentor for our teachers in the district has helped him become familiar with the district, and he lives in the district,” Horstman said. Horstman described Fuerst as a “good, natural fit” for the district. Fuerst and his wife, Diane, have five children and 11 grandchildren.